Archbishop Martin describes 37-year-old mother of five as a “woman of deep faith” who made "a deep impression right across the country”. The head of the Catholic Church in Ireland has paid tribute to Emma Mhic Mhathúna, the recently deceased mother of five who came to national prominence after speaking publicly about her terminal cancer diagnosis following incorrect smear test results. 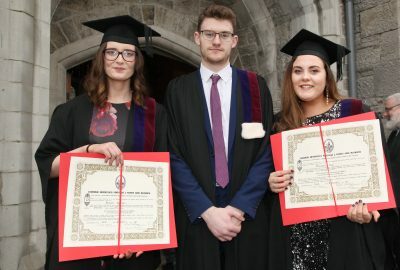 In his address as Chancellor of the Pontifical University in Maynooth, Archbishop Eamon Martin told the 232 lay women and men conferred on Saturday with academic awards in theology, philosophy and education, that Ms Mhic Mhathúna’s testimony in the CervicalCheck controversy had been “courageous and powerful”. He said it had made “such a deep impression right across the country”. Archbishop Martin said Ms Mhic Mhathúna, 37, was a “woman of deep faith”, and had been proud to study on the Bachelor of Arts and theology programme in St Patrick’s College in 2014–15. Dr Martin said he was pleased to hear from the President of St Patrick’s College of the intention to have an award dedicated to Emma Mhic Mhathúna to assist mature students who wish to return to education. He encouraged the new graduates not to see their graduation on Saturday as the end of their theological journey, but “as an overture to your participation in the mission of the Church as lay women and men, as clergy or in the consecrated life”. The Archbishop of Armagh recalled Pope St John Paul II’s visit to Limerick almost 40years ago in which he told the assembled pilgrims, “The great forces which shape the world – politics, the mass media, science, technology, culture, education, industry and work – are precisely the areas where lay people are especially competent to exercise their mission. On the theme of missionary disciples, Archbishop Martin recalled how in 1916, a young Cork priest called Fr Edward Galvin visited Armagh and won the support of his predecessor, Cardinal Logue, for an Irish Missionary Society for China. When Fr John Blowick, the professor of moral theology at Maynooth stepped forward to volunteer for the mission, it encouraged many others to follow suit and, one hundred years ago this year, the Maynooth Mission to China was founded. It later became known as the Missionary Society of St Columban. The Archbishop of Armagh also recalled Fr Galvin’s words when he admitted that perhaps the whole idea was “a bit of a mad thing to do”, but still, the first missionaries set out in 1920, inspired by the thought of “a million souls in China to be won for Christ”. “God’s grace blessed their efforts – the Columbans continued to proclaim the Gospel in China until they were expelled in the early 1950s. By then, the Columban Sisters had been founded, and new mission fields were open in the Philippines, Korea, Burma and Japan. Eventually Columban missionaries – priests, religious and lay women and men – would proceed to Latin America, Australia, Fiji, Pakistan and Taiwan, Brazil, Jamaica and Belize and Myanmar. Though sometimes we tend to think that this commission was only for the chosen few, Pope Francis reminds us that every baptised person is a missionary, Archbishop Martin said. He challenged the graduates of 2018 to be missionary disciples. “Your fellow students in 1918 stepped up to be part of the Maynooth Mission to China and their courage and enthusiasm for spreading the joy of the Gospel was infectious! There is no reason why you, the graduates of 2018 cannot form the core of a Maynooth Mission to Europe, to Asia, Africa, Australia and the Americas. Over 800 lay students are registered at the Pontifical University, including the first recipients from Ulster of the Cardinal O’Fiaich scholarships.